I grew up in the heyday of Choose Your Own Adventure books, which allowed the reader to make choices from a list of options at certain junctures in the narrative. A lot of them led to death, because that was more or less games in the seventies and eighties for you. You know how often you die in command-based PC games from that era? I’m told the same was true of early Dungeons & Dragons. Anyway, the formula was so popular that there were a lot of knock-offs. I had a bunch of ones based in the D&D universe, and there was a series of Narnia ones as well. I believe I owned all of those except two. These were a little more complicated than the basic CYOA series, as you had some character statistics and had to keep track of items you’d collected and events you’d experienced. 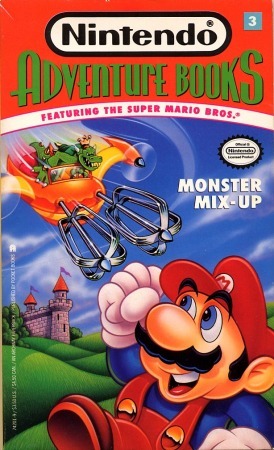 Somewhat later, there were the Nintendo Adventure Books, and I had all of those. There were a total of twelve, all but two based in the Mario universe. I remember their using a slogan along the lines of “Now your favorite games can be your favorite novels!” I’d say calling them novels was a stretch, but they were pretty fun. There were items you could collect, some of them actually from the games and others not. Also, there was a scoring system, although the math was off in some of the books. I think there was one where it was impossible to reach the highest score level, and another where you could get way past it. Double Trouble – Mario arrives in the Mushroom Kingdom to find that there are duplicates of pretty much everyone, friend and foe alike. 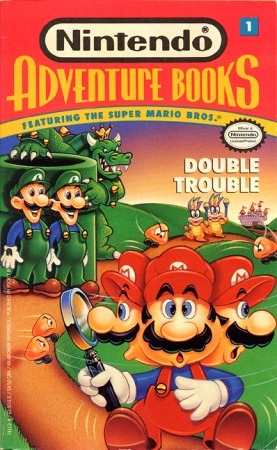 In a successful read-through, he finds that the duplicates are made of sand by a duplicating robot built by Iggy Koopa, who in these books is the mad genius inventor of the family (it’s Ludwig/Kooky in the cartoons). The book introduces the royal guards Gerkin and Brock, minor characters who appear in a few of these. 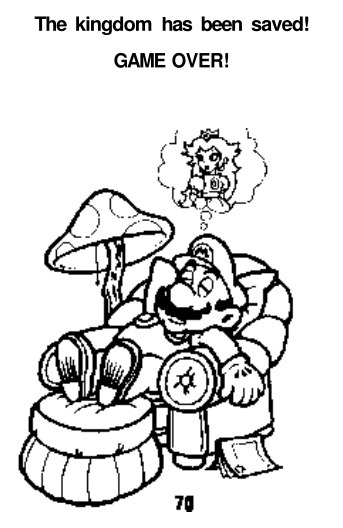 We also learn that Fort Koopa in the Koopahari Desert is the Koopa family’s summer home. 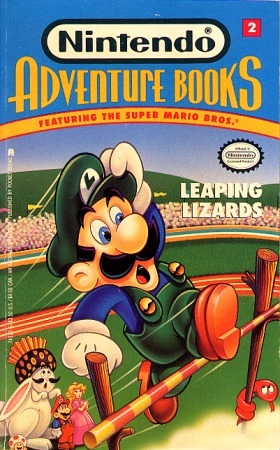 Leaping Lizards – You play as Luigi in this one, and I recall the story being somewhat more straightforward than in the first book, at least if you make the right choices. When Morton Koopa Jr. turns the Mushroom King into a rabbit, Luigi learns that only a particular magic whistle can change him back. Unfortunately, that whistle is the property of the Koopas unless someone can beat them in the annual Mushroom Games. In addition to the Koopas, the Mushroom Kingdom Royals also compete against the Hammers (made up of Hammer Bros. and related enemies, including one named Angus Boomer) and the Sneaks (comprised of various monsters). You have to make the right choices to win the games and restore the King. A new character here is the referee at the games, a penguin named Feldspar. I believe this book says Toad is only two feet tall, which seems unlikely. Maybe that’s when he’s been hit by an enemy and shrunk. Monster Mix-Up – The Mario gang attends the circus, and the Princess is kidnapped during a souvenir photo shoot. When Mario and friends try to find her, they get caught in a plot involving a machine that combines the features of Bowser’s minions. I recall this one being quite roundabout, with characters constantly appearing and disappearing, although Toad is usually present. It’s easy to get caught in loops, although this can be an easy way to rack up points. At one point, Bowser mixes the King with a dumb Koopa Troopa named Elmo, and for some reason the resulting combination turns out to be much smarter than either one. 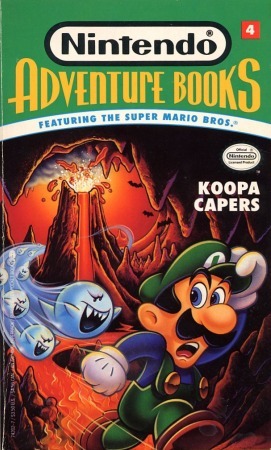 Koopa Capers – When Wendy O. Koopa goes missing, Bowser uses a flying carpet to abduct Luigi (Mario is away fixing a leak at Niagara Falls), and forces the plumber to find his daughter. Luigi explores the fortress behind Bowser’s castle and the nearby Magma Pits, eventually discovering (well, assuming you don’t die first) that Wendy has discovered a spell to combine the powers of her wand with those of her brothers. When Luigi tracks her down, the other Koopas are close behind, and Luigi has to find a way to get away from all of them. Well, it doesn’t take that much strategy, but it DOES depend on your having gotten a particular item earlier on. Pipe Down! – At the Princess’ birthday party, she receives some new basketball shoes, which when placed on her feet make her run across the kingdom while dribbling a ball. 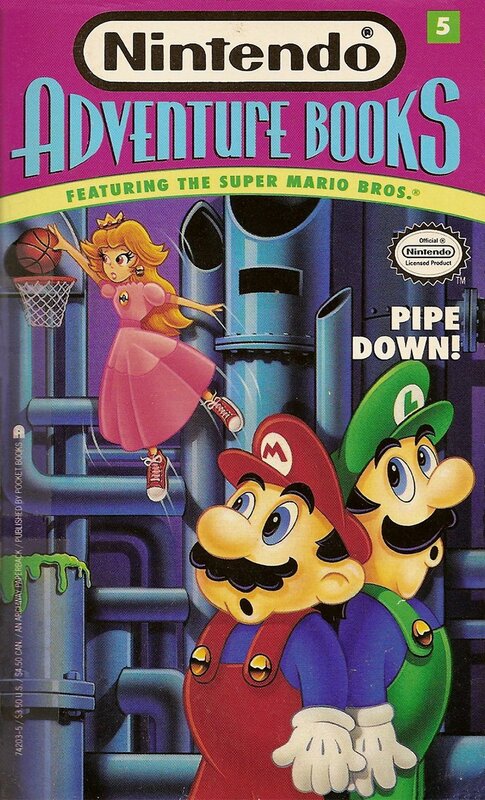 Mario and Luigi pursue her to Pipe World, where it turns out that this is part of a plot by Ludwig von Koopa to create a new basketball ballet, accompanied by his enormous pipe organ. Defeating him requires the brothers to have retrieved the proper magic shoes from the kingdom’s shoe vault. It’s revealed here that Ludwig, like his namesake, is deaf; but the good ending involves his hearing being restored. 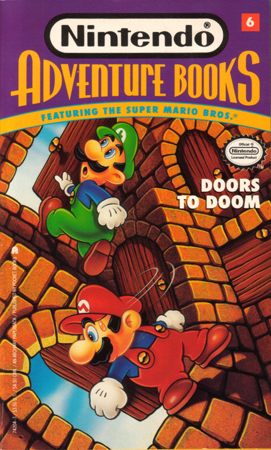 Doors to Doom – The mad Dr. Sporis von Fungenstein has a plot to make mushroom and turtle soup out of the Mushroom Kingdom’s inhabitants, and he uses his Doors to Doom machine to send Mario and Luigi to places they’d visited in previous games, only with a twist. Peach has been kidnapped by Donkey Kong, Bowser is in the cage in which Mario kept DK (an event that both brothers acknowledge without addressing the morality of it), and Wart (in his only appearance in this series) has reinvented himself as a skateboarder. 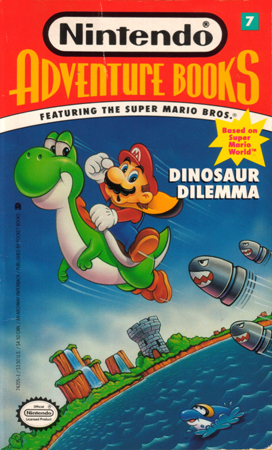 Dinosaur Dilemma – The first of these books to be based on SMW has Mario and Luigi on vacation in Dinosaur Land. They’ve already befriended Yoshi, who here is identified as an iguanodon and doesn’t speak English, but are rather annoyed by his tendency to eat all their food. Luigi goes missing, and when Mario and Yoshi try to track him down, they come across yet another bizarre Koopa plot. This time, Bowser is planning to turn all of the dinosaurs into an omelette, while winning a scholarly award for his phony theory that they died out because they didn’t look both ways before crossing the street. Aside from Mario, Luigi, and Bowser, the usual suspects don’t appear in this one. The Koopa scholars are all named after real-world celebrities: C. Everett Koopa, Gary Koopa, and James Fennimore Koopa. I remember Everett having a line about Bowser’s castle being hazardous to his health, but I forget what jokes might have been used with the others. 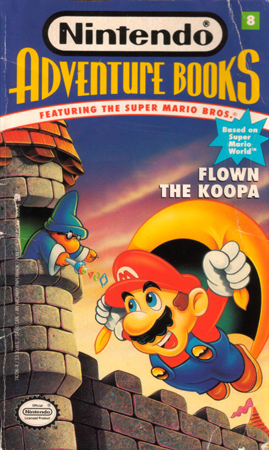 Flown the Koopa – I don’t remember this one so well, but I know it involved the gang visiting Dinosaur Land to see Yoshi in the Dino-Flying Derby. The dinosaurs there have the worst luck, as they’re all captured and turned to stone, or else trapped inside a television set, by a Magikoopa who’s identified as Bowser’s third cousin twice removed. Bowser’s own role in this one is small, but you need to encounter him and take his remote control to win. There were also Cheep Cheeps that nested in a tree, which is pretty weird considering that they’re fish. 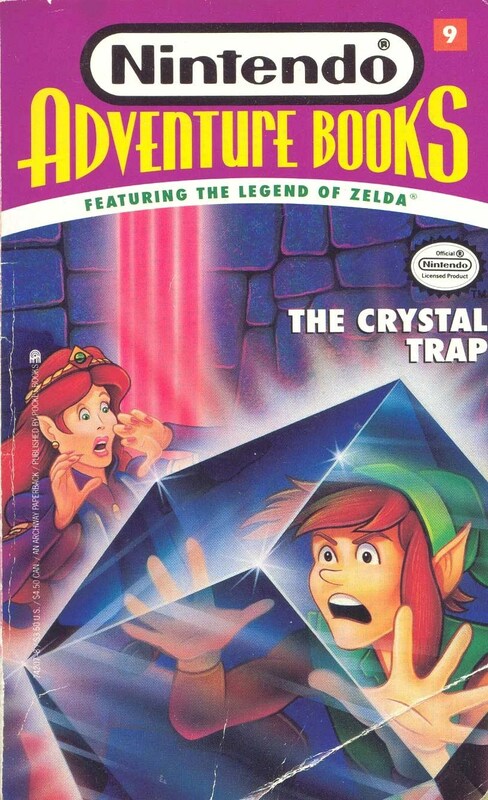 The Crystal Trap – I believe the original intention was to have Zelda books for all the rest of the series, but they must not have sold as well. 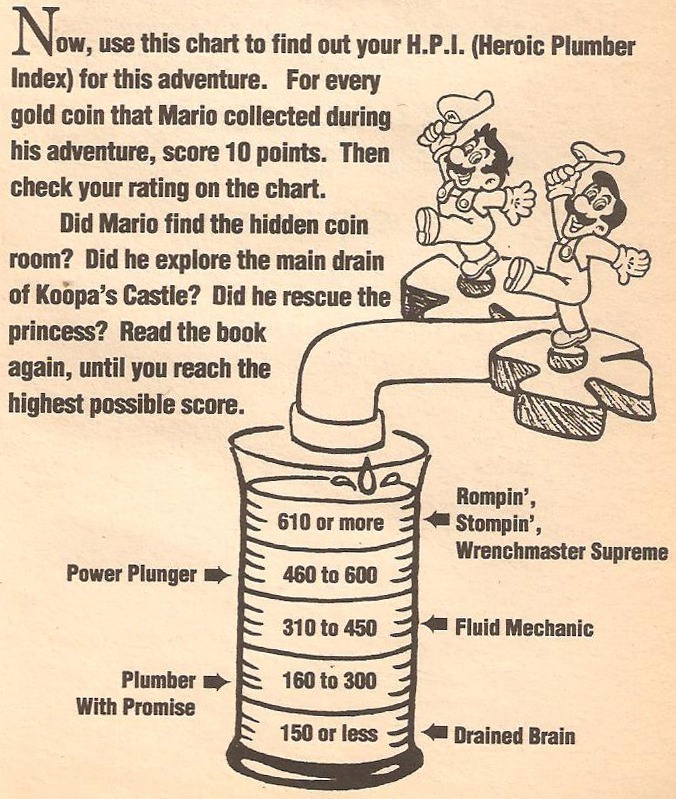 I had the two they did publish, and they were rather less goofy than the Mario ones, but not all that memorable. Link and Zelda were largely the same as in the cartoons and the Nintendo Comics System, with the former being cocky and jokey. In this one, Ganon encases the Triforce in crystal so it can’t be used against him, and the spell affects Link as well because he keeps the Triforce of Courage in his heart. You play as Zelda, which is pretty rare. The Shadow Prince – A mysterious prince shows up and endears himself to Zelda and her father, but Link doesn’t trust him. I don’t recall that much about the plot, but if you don’t mind me spoiling it, the prince is actually Ganon in disguise. Unjust Desserts – Much like Bowser’s Inside Story, this has a Fantastic Voyage sort of plot, only here it’s Yoshi whose body is the setting. 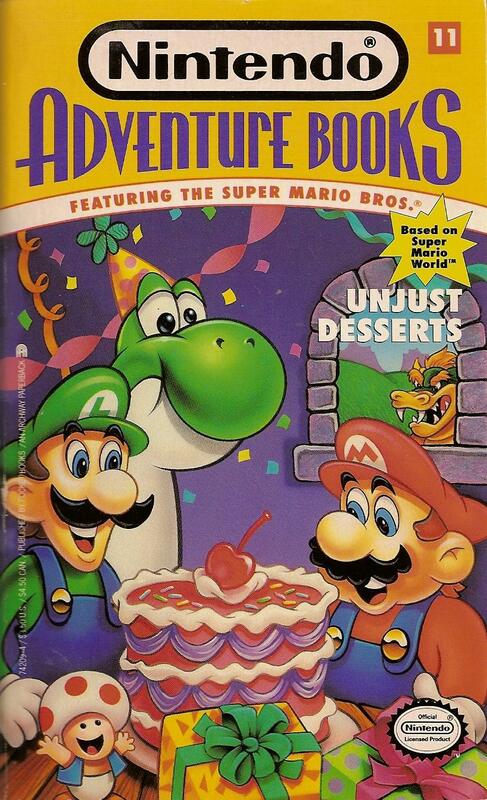 When a cursed Koopa Cherry on his birthday cake makes Yoshi eat everything in sight, including Luigi, Mario enlists the help of a duck doctor to shrink down and rescue his brother. I can’t recall exactly how it works out, but I know there were tiny dolphins inside of Yoshi. Brain Drain – The final book in the series has Iggy broadcast static over the radio that switches the brains of anyone who hears it. 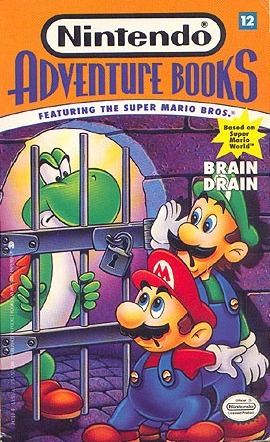 Mario, Luigi, and the Princess find the source of the static in Dinosaur Land; and Luigi infiltrates Iggy’s command center in a Koopa Troopa body. Oddly, the body is equipped with a cannon that shoots Koopa shells. Helping out is a psychiatrist with a German accent named Dr. Sigmund Shrinkasaurus, who despite his name is not a dinosaur, but a human-sized gander. One joke I remember is that the King has a machine with 365 flavors of soda, because his doctor told him he needed to vary his diet. This entry was posted in Authors, Book Reviews, C.S. Lewis, Chronicles of Narnia, Donkey Kong, Games, Mario, Video Games, Zelda and tagged brain drain, cheep cheeps, choose your own adventure, dinosaur dilemma, dinosaur land, donkey kong jr., doors to doom, double trouble, dungeons and dragons, flown the koopa, ganon, hammer brothers, iggy koopa, king bowser koopa, koopa capers, leaping lizards, link, ludwig von koopa, luigi, magikoopas, mario and luigi: bowser's inside story, monster mix-up, morton koopa jr., mushroom king, mushroom kingdom, narnia solo games, nintendo adventure books, pipe down!, princess peach toadstool, super mario world, the crystal trap, the shadow prince, toad, triforce, unjust desserts, wart, wendy o. koopa, wooster, yoshi. Bookmark the permalink.